The declining coal industry has left nearly 100,000 former miners unemployed in West Virginia. But a new nonprofit called the Appalachian Beekeeping Collective hopes to bring a new, more eco-friendly industry to the region: beekeeping. The charity was founded with funds from a $7.5 million settlement from a lawsuit against coal mine company for violating the Clean Water Act. The money has been used to fund environmental restoration projects and to develop sustainable economic opportunities in the once-thriving region that now has the highest unemployment rate in the country. So far, the collective has trained 35 former coal miners as beekeepers, and will train 50 more in a few weeks. James Scyphers, a displaced coal miner who worked in the industry for 20 years. 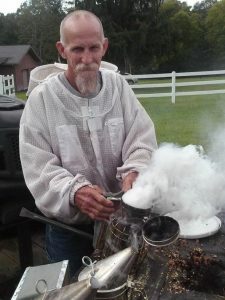 Graduates of the free “Introduction to Beekeeping” classes receive free or reduced-cost bees and equipment, and have access to ongoing training and mentorship. They can opt to maintain between two and 20 hives. 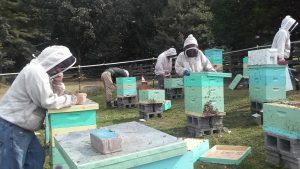 The trained beekeepers will harvest their first honey this spring (2019). The non-profit will collect, bottle and sell the honey for them, paying them market rate (currently $7 a pound). With the potential to earn earn over $700 per hive, 20 hives could earn $15,000 per season. The organization also are also offers training in making candles, lip balm and other wax products for additional income opportunities. For very part-time work from home, it provides a decent supplemental income for people struggling to make ends meet. Plus, beekeeping helps ensure the survival of threatened bee populations by giving them a place to live, and improves the health and biodiversity of local ecosystems. “It’s not common knowledge that the honey bee can only survive in many parts of the world due to the beekeeper,” writes beekeeper Paul Webb. “Wild colonies have dwindled to the point of extinction due to modern agriculture. Huge expanses of land which now grow a single crop were once home to thousands of plants providing nectar and pollen for the honey bee and many other insects. Woodland has also disappeared, where traditionally a honey bee colony would find its home in the hollow trunk of a tree. This reduction of biodiversity, and decrease of animal populations has a huge environmental impact.